After the Border Cats folded, the UHL added an expansion team in time for the 2002-03 season. The team was owned by Ken and Kristen Dixon of Ohio. Many expected the new team to be called Flags, but the owners decided to go with a unique, and goofy, nickname: Beacons. The Beacons lasted from 2002-05, and actually were competitive on the ice in two of their three seasons. However, the fanbase, still smarting from the Border Cats and cool towards the Beacons ownership, did not respond to the new team like they did during the heyday of the Border Cats. After three seasons, the Dixons moved the Beacons to Roanoke, Virginia. 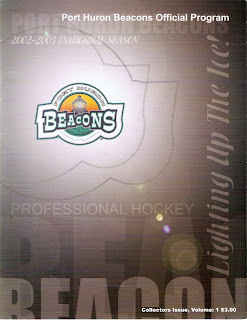 I was not a Beacons fan, and therefore, only went to one of their games (a playoff game against Flint). I didn't like the nickname (the logos were goofy as well), and didn't care for the lack of effort I thought the Dixons made to market the team in Port Huron. However, I have bought a couple Beacons programs a year or so ago online. Here they are. 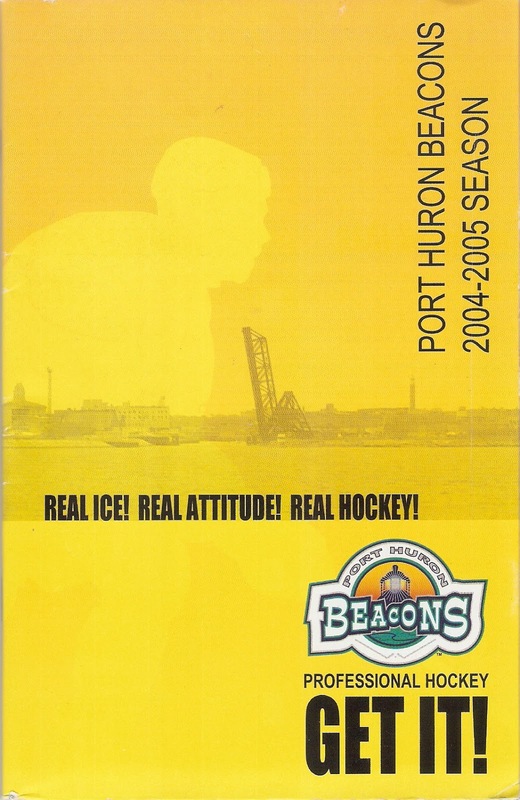 2002-03 was the first season of Beacons hockey in Port Huron. The Dixons hired Brad Jones, former BC Icemen coach, to lead the squad in Year One. However, 53 games into the season, Jones was fired with a mediocre 24-24-5 record. He was replaced for the remainder of the season by former UHL heavyweight Bruce Ramsay, who led the Beacons to a 14-6-3 record. The team went 38-30-8, good enough for fourth place in the East, 15 points behind first place Fort Wayne. Attendance climbed slightly from the last Border Cats season, but was still a dismal 1991 per game. Offensively, the Beacons were led by former Thunder Bay forward Jason Firth, who scored 26 goals and 98 points. Chris MacKenzie, Brent Gretzky (yes, Wayne's brother), Peter Bournazakis, Michel Beausoleil and Bob McKillop each scored at least 20 goals. As a team, the Beacons scored 248 goals. In nets, Kory Cooper played the majority of the games. Cooper went 26-17-7 in 54 games with a 3.19 GAA and 3 shutouts. Bujar Amidovski played in 28 games, going 11-13 with a 3.80 GAA. Overall, the Beacons were scored on 268 times. The Beacons made the playoffs in their first season, but didn't last long. They faced first place Fort Wayne, and were quickly ousted by the eventual champion Komets in three straight, outscored 12-5 in the process. Ramsay would return for the second season, and lead the Beacons to third place with a 38-31-7 record in 2003-04. More importantly, his Beacons would advance to the second round, the first time a Port Huron team won a playoff series since 1979-80. Attendance declined however, reaching a low of 1493 per game, worst in the league. After a successful 2003-04 season, Ramsay was let go in favor of Rick Adduono, fresh off a successful run in the ECHL. However, his Beacons struggled in 2004-05, bringing up the rear in the East with a 34-40-6 record, fourth worst in the UHL. Attendance slightly improved, but was still a league-low 1659 per game. Aaron Brand returned to the Beacons and led the team in scoring that year, scoring 31 goals and 82 points. David Alexandre Beauregard returned to Port Huron and scored a team-high 47 goals. Joey Sewell (27) was the only other 20-goal scorer, as the Beacons lit the lamp 245 times. The team used three goaltenders in 2004-05, led by former Border Cat Stu Dunn. Dunn was in net for 41 games, with a 16-17-2 record, a 3.31 GAA and 2 shutouts. Former NHLer Daniel Berthiaume joined the team, but struggled to a 7-17-3 mark with a 3.56 GAA. Kory Cooper managed appearances in 20 games, with a 11-6-1 mark and 2 shutouts. Overall, the Beacons allowed 283 goals, fourth worst in the league. The team stumbled out of the gates in 2004-05, winning only 6 of their first 20 games. By March, they recovered enough to reach .500 (28-28-4), but a 10-game winless streak effectively ended their season. After three years and facing losses rumored to be in the millions, the Dixons had enough of Port Huron and moved the Beacons to Roanoke, Virginia for the 2005-06 season. The newly-named Roanoke Valley Vipers were a disaster in their lone season, going 17-53-6, dead last in the UHL. Even worse, the team drew a meager 1521 per game, less than they did in their final season in Port Huron and in an arena that was nearly 5000 seats larger than McMorran Arena. The Vipers folded after one season. 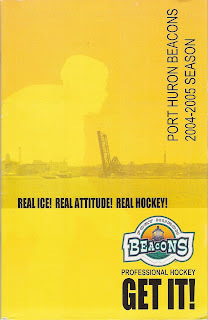 Port Huron would get a third shot at UHL hockey after the Beacons left town, as the UHL granted an expansion franchise to local businessmen for the 2005-06 season. Bonus: Port Huron Flags "Old Timers"